Since it first came into the public eye in about 2011, so called ‘ISIS’ has committed many atrocities in the name of their interpretation of Islam. Unfortunately, this has coloured the perceptions of many people in the West, causing them to view Muslims, the moderate, non-violent ones who follow true Islam, in an equally negative light. In recent times this has led to a huge increase in Islamophobia, with people like Donald Trump growing in popularity. He is currently the front-runner for the Republican presidential candidate, and as such has a lot of influence, which has led to his views spreading through society as a whole. Here in the UK, there are thought to be twenty-four different political groups attempting to spread Islamophobia – this includes ‘Britain First’ and EDL – the ‘English Defence League’. But while we see this kind of high-profile Islamophobia now, it’s been present in everyday life for years. For example, in 2009 there was an arson attack on the Greenwich Islamic Centre. However, these attacks are becoming more and more common. In the week after the Paris attacks 115 anti-Islam hate crimes were reported, although the actual figure is believed to be much higher as many Muslims are scared to report attacks, or have unfortunately become so accustomed to them that they no longer see the point. And younger children have been influenced too. Some months ago, my brother accidentally took this T-shirt to school instead of his PE kit. 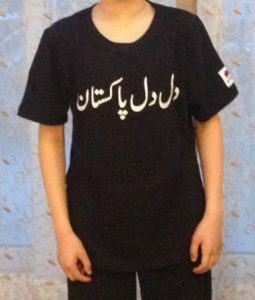 The slogan is in Urdu, not Arabic, and simply means ‘I love Pakistan’, but his classmates’ first reaction was to link it to ISIS. Even nine-year-olds have been brainwashed by the media. Islamophobic attacks play into the hands of ISIS, making Muslims feel alienated and not part of the community. It’s believed that ISIS carries out attacks in the hope of this happening, as they believe that Muslims feeling hated and unwanted will be motivated to join them. So, we wanted to talk about ISIS and explain how separate it is from mainstream Islam. Starting with the name: ISIS stands for ‘the Islamic State of Iraq and Syria’, however many Muslims actually resent the title, the vast majority agreeing that there is absolutely nothing Islamic about anything they do. A growing trend in the West, and something that has been common in many Middle Eastern countries before now, is calling them Daesh instead. This is an acronym of the group’s Arabic name: ‘Al-Dawla al-Islamiya fil Iraq wa al-Sham’, but also sounds like other more negative Arabic words, meaning ‘someone who crushes’ or ‘the one who sows discord’. Acronyms are not common in Arabic, so even without that association, to Arabic speakers the term comes across as something made up and strange. On the other hand, the Arabic word for peace, ‘salam’, is the basis for a lot of Islamic terminology. The Islamic greeting, ‘Assalamu alaykum’ means ‘May the peace and blessing of God be upon you, and it is even the basis for the word ‘Islam’. A ‘Muslim’ is literally a person of peace. On that basis, most Muslims maintain that however they view themselves, the people of ISIS, or Daesh, cannot be considered Muslims at all. Also, the phrase ‘Allahu Akber’ actually means ‘God is the greatest’, it’s not an aggressive phrase, contrary to popular belief. It’s also worth mentioning that although ISIS refer to themselves as Muslims, many more Muslims are killed than non-Muslims. ISIS are based in the Iraq/Syria area and carry out many attacks on the populations of these countries, who are prominently Muslim. A United Nations report from September 2014 found that ‘at least 24,000’ Iraqi civilians — the vast majority of whom were Muslim — had been killed or injured by Daesh in the first eight months of 2014 and the authors of the report warned that their numbers were likely too low. However, Western media ignores this fact, preferring to focus on the deaths of proportionately very few non-Muslims. This picture is from the United Nations website and illustrates the amount of murders in the Levant area from January to August 2014. 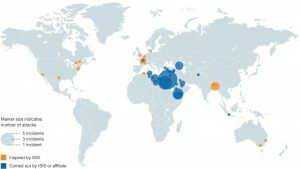 The blue dots show where direct ISIS attacks took place, and the larger the dot indicates a higher number of casualties. 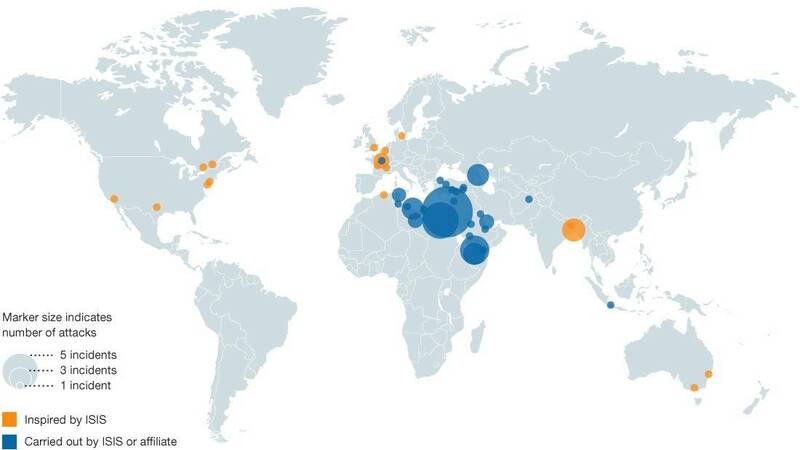 As you can see, the areas hit by the largest attacks are majority Muslim areas. The leader of the group, who goes by the name Abu-Bakr al Baghdadi, comes from the al-Badri tribe, widely acknowledged as being descendants of the Prophet Muhammad* himself. This has gained him a following from many people who believe that this qualifies him as a caliph, however Islam places zero significance on ancestry, thereby rendering his claims pointless. A French journalist named Didier François, held hostage for 10 months, is one of the few prisoners who have been released. In interviews he has stated that the organisation is much more interested in politics than religion. 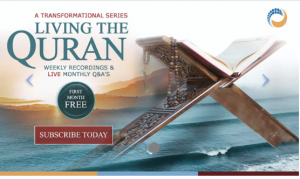 He said that they never had any religious discussions and were far more concerned with forcing their own, flawed, beliefs on the captives than teaching them about religion, refusing to even give them a Quran. In fact, the verses ISIS quotes to justify its actions do not back them up in the least: most of them are cherry picked without context, and actually refer to very specific situations or even something totally different. For example, in chapter 2, verse 191, the Quran says, ‘kill them wherever you find them’. However, this ‘them’ refers specifically to ‘those who fight you’, mentioned in the previous verse, making it clear that fighting is only allowed in self-defence. The same verses instruct Muslims ‘not to commit aggression’ – i.e. not to start fights, and some variation on ‘do not fight unless they fight you’ is repeated five times in the surrounding four verses. In verse 29 of chapter 9, it says ‘fight until they feel subdued’. Again, this is specific to one situation: the Byzantines had tortured and murdered the ambassador the Prophet* had sent without any provocation, so that it was justified to fight them. The treatment of the captives is in stark contrast to how prisoners of war were treated at the Prophet*’s time. After their battles – of which, incidentally, every one was in self-defence and with real provocation – the Muslims used to take a few hostages who would be ransomed. Unlike ISIS’s hostages, these prisoners were treated almost as honoured guests, with kindness and care. Their guards often fed them better than they ate themselves. One man, Walid ibn Walid, surrendered during a battle and was taken prisoner. His brother came to Madinah to pay his ransom, but he had been so impressed by the compassionate way in which he had been treated that he ran away from his brother during the night and ran back to Madinah to become a Muslim. An important point here is that converting was totally voluntary. Never once during the Prophet*’s time or any of the following caliphates was Islam ever forced on anyone. Even after he took over the entire Middle East, Caliph Omar took great pains to preserve the safety and religious freedom of all non-Muslims under his rule. This peaceful and amicable rule was what enabled society to continue harmoniously for a thousand years. François and his French companions were released in April 2014, but some of their American counterparts were not. A video was released that August purporting to show the killing of American photojournalist James Foley, the first in a string of beheadings by so-called Jihadi John. The verse supposedly allowing beheadings is another one that has been misquoted: verse 4 in chapter 47 says ‘When you meet the disbelievers, smite their necks’, and has been referred to as justification several times. What ISIS doesn’t mention is that that verse continues with ‘until the war lays down its burdens’, letting us know that this refers only to killing during battle, not as a method of execution. The Quran is very clear on the fact that it is only permissible to kill soldiers, and that civilian non-combatants are supposed to be kept safe. In chapter 5, verse 32 it says ‘…if anyone killed a person… it would be as if he killed all mankind, and if anyone saved a life, it would be as if he saved the life of all mankind.’ Based on this, the murder of so many peaceful journalists goes completely against Islam. Another video showed Lieutenant Mu’adh Al-Kasasbeh, a Jordanian Air Force Pilot, burned to death in a cage. There have also been reports of militants burning ancient books and manuscripts, and millennia old churches and historic buildings. Last February it was also reported that they had burned an entire village in western Iraq, resulting in the deaths of 45 people. All of this is absolutely against Islamic rulings, which say that burning anything of anyone else’s is categorically prohibited. This includes crops and homes, as well as burning people. As we’ve mentioned, of the three battles fought during the prophet PBUH’s time, none of them were instigated by the Muslims. All were in self-defence, and in fact fought with huge odds against the Muslims. In contrast, nothing ISIS has done has been provoked. Although it seems like they are very strong, at the moment ISIS itself is actually very weak, and the reason they spread these videos is to make themselves seem scarier and more powerful. ISIS’ actions have affected the world’s view of Islam, causing Muslims to be seen in a very negative light. So we hope that today we have destroyed those links, and explained how little they actually follow true Islam.